These Terms will apply to any contract between us for the sale of Products to you (Contract). Please read these Terms carefully and make sure that you understand them, before ordering any Products from our Website. Please note that before placing an order you will be asked to agree to these Terms. If you choose not to accept these Terms, you will not be able to order any Products from our Website. You should print a copy of these Terms or save them to your computer for future reference. We may amend these Terms from time to time as set out in paragraph 7. Every time you wish to order Products, please check these Terms to ensure you understand the terms which will apply at that time. These Terms, and any Contract between us, are only in the English language. We operate the website [domain]. 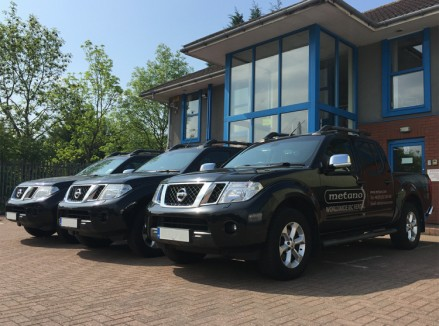 We are Metano Limited, a company registered in England and Wales under company number 02893198 and with our registered office at Unit 14/15 Whinfield Way, Whinfield Industrial Estate, Rowlands Gill, Tyne & Wear, NE39 1EH. Our main trading address is our registered office. Our VAT number is 918 2867 90. You may contact us by telephoning our customer service team at [contact_number] or by e-mailing us at [contact_email]. If you wish to give us formal notice of any matter in accordance with these Terms, please see clause 17. The images of the Products on our Website are for illustrative purposes only. Although we have made every effort to display the colours accurately, we cannot guarantee that your computer's display of the colours accurately reflects the colours of the Products. The Products you receive may vary slightly from those images. Although we have made every effort to be as accurate as possible, all sizes, weights, capacities, dimensions and measurements indicated on our Website have a % tolerance. you shall not have any claim for innocent or negligent misrepresentation or negligent misstatement based on any statement in this Contract. Our Website pages will guide you through the steps you need to take to place an order with us (Order). Our Order process allows you to check and amend any errors before submitting your Order to us. It is your responsibility to ensure that the information you submit to us with your Order is correct, up to date, not misleading and accurate. Please take the time to read and check your Order at each stage of the Order process. We will only confirm our acceptance of your Order to you by sending you an e-mail that confirms that the Products [have been] [are ready to be] dispatched (Dispatch Confirmation). The Contract between us will only be formed when we send you the Dispatch Confirmation. If we are unable to supply you with a Product, for example because that Product is not in stock or no longer available or because we cannot meet your requested delivery date or because of an error in the price on our Website, we will inform you of this by e-mail [DN: can this be accommodated?] and we will not process your Order. Please note, if you have already paid for the Products in advance, we will refund you the full amount [including any delivery costs charged] as soon as possible. We may amend these Terms from time to time. We may revise these Terms as they apply to your Order from time to time to reflect changes in relevant laws and regulatory requirements or when updating our contact details. If we have to revise these Terms as they apply to an accepted Order, we will contact you to give you reasonable advance notice of the changes and let you know how to cancel the Contract if you are not comfortable with the changes. You may cancel either in respect of all the affected Products or just the Products you have yet to receive. If you opt to cancel, you will have to return (at your own cost) any relevant Products you have already received and we will arrange a full refund of the price you have paid for the Products. We will contact you with an estimated delivery date, which will be within 30 days after the date of the Dispatch Confirmation (the date on which we e-mail you to confirm our acceptance of your Order). The estimated delivery date is an estimate only and any date given by us cannot be guaranteed as the date of actual delivery to you. Occasionally our delivery to you may be affected by an Event Outside Our Control. See clause 15 for our responsibilities should this happen. Delivery of an Order shall be completed when we deliver the Products to the address you provided to us with your Order and the Products will be your responsibility from that time. You own the Products once we have received payment for the Products in full, including all applicable delivery charges. It is your responsibility to check the Products on delivery. On delivery, you will be asked to sign for the Products confirming receipt in good condition. If the Products do not appear to be in good condition then please refuse the delivery. If you are unable to check the contents of your delivery at the point of delivery then please sign for the parcel as “UNCHECKED”. Failure to do so may affect any warranty or other claims that you make thereafter. If you fail to accept delivery of the Products and without prejudice to any other rights and remedies available to us, we may store the Products until delivery takes place, and charge you for all related costs and expenses (including, without limitation, insurance) and after a period of 21 working days resell or otherwise dispose of part or all of the Products and, after deducting reasonable storage and selling costs (including, without limitation, insurance), account to you for any excess over the price of the Products or charge you for any shortfall below the price of the Products. The quantity of any consignment of Products as recorded by us upon dispatch shall be conclusive evidence of the quantity received by you on delivery unless you can provide conclusive evidence proving the contrary. We shall not be liable for any non-delivery or delays in delivery of Products (even if caused by our negligence). Our liability for non-delivery of the Products shall be limited to replacing the Products within a reasonable time or issuing a credit note at the pro rata Contract rate against any invoice raised for such Products. For reasons of health and safety and to avoid property damage, most large items can only be delivered to the exterior of a ground floor location at the delivery address. You must therefore make your own arrangements at your own risk if the relevant items need to be transported from the delivery location. We deliver to the countries listed on the following page of our Website [insert link to page listing the countries] (International Delivery Destinations) [DN: you should include a link to the relevant page of your website that lists all countries you deliver to. If you are able to deliver products worldwide, we can amend this clause accordingly. Please confirm.]. However there are restrictions on some Products for certain International Delivery Destinations, so please review the information on that page carefully before ordering Products. If you order Products from our Website for delivery to one of the International Delivery Destinations, your Order may be subject to import duties and taxes which are applied when the delivery reaches that destination. Please note that we have no control over these charges and we cannot predict their amount. You must comply with all applicable laws and regulations of the country for which the Products are destined. We will not be liable or responsible if you break any such law or fail to comply with any such regulations. The prices of the Products will be as quoted on our Website at the time you submit your Order to us. We use our reasonable endeavours to ensure that the prices of Products are correct at the time when the relevant information was entered onto our Website. Prices for our Products may change from time to time, but changes will not affect any Order you have already placed with us and we have accepted by virtue of the fact we have sent you our Dispatch Confirmation. The price of a Product [includes VAT (where applicable) at the applicable current rate chargeable in the UK for the time being. However, if the rate of VAT changes between the date of your Order and the date of delivery, we will adjust the VAT you pay, unless you have already paid for the Products in full before the change in VAT takes effect] OR [is exclusive of VAT (if any). You shall, on receipt of a valid VAT invoice from us, pay to us such additional amounts in respect of VAT as are chargeable on a supply of a Product] [DN: please confirm whether or not VAT is included in the price]. Our Website contains a large number of Products. It is always possible that, despite our reasonable efforts, some of the Products on our Website may be incorrectly priced. If we discover an error in the price of the Products you have ordered we will contact you to inform you of this error and we will give you the option of continuing to purchase the Product at the correct price or cancelling your Order. We will not process your Order until we have your instructions. If we are unable to contact you using the contact details you provided during the Order process, we will treat the Order as cancelled and notify you in writing. Please note that if the pricing error is obvious and unmistakeable and could have reasonably been recognised by you as a mispricing, we do not have to provide the Products to you at the incorrect (lower) price. If you fail to pay us any sum due pursuant to the Contract, you shall be liable to pay interest to us on such sum from the due date for payment at the annual rate of 4% above the base rate from time to time of the Bank of England, accruing on a daily basis until payment is made, whether before or after any judgment. We reserve the right to claim interest under the Late Payment of Commercial Debts (Interest) Act 1998. [insert list of accepted credit and debit cards and any alternative payment methods]. conform in all material respects with their description provided at the time of your Order. any specification provided (or otherwise stipulated) by you. Subject to clause 13.2, in the event that the Products supplied do not comply with the warranties in clause 13.1, we shall, at our sole option replace the defective Products (or defective components, as appropriate) or refund the price of the defective Products received in full. Subject to clause 14.1, our total liability to you in respect of all losses arising under or in connection with the Contract, whether in contract, tort (including negligence), breach of statutory duty, or otherwise, shall in no circumstances exceed the price of the Products. We will not be liable or responsible for any failure to perform, or delay in performance of, any of our obligations under a Contract that is caused by an Event Outside Our Control (as defined below). You may cancel a Contract affected by an Event Outside Our Control which has continued for more than 30 days. To cancel please contact us. If you opt to cancel, you will have to return (at your own cost) any relevant Products you have already received and we will refund the price you have paid, including any delivery charges paid by you at the time you placed your Order. If you become subject to any of the events listed in clause 16.2, or we reasonably believe that you are about to become subject to any of them and notify you accordingly, then, without limiting any other right or remedy available to us, we may cancel or suspend all further deliveries under the Contract or under any other contract between us and you without incurring any liability to you, and all outstanding sums in respect of Products delivered to you shall become immediately due. (being an individual) you die or, by reason of illness or incapacity (whether mental or physical), are incapable of managing your own affairs or become a patient under any mental health legislation. A notice or other communication shall be deemed to have been received: if delivered personally, when left at our registered office; if sent by pre-paid first class post or other next working day delivery service, at 9.00 am on the second working day after posting or if sent by e-mail, one working day after transmission. We both irrevocably agree that the courts of England and Wales shall have exclusive jurisdiction to settle any dispute or claim arising out of or in connection with a Contract or its subject matter or formation (including non-contractual disputes or claims). Nothing in this paragraph shall limit either parties' right to take proceedings or enforcement action against the other in any other court of competent jurisdiction, nor shall the taking of proceedings or enforcement action in any one or more jurisdictions preclude the taking of proceedings or enforcement action in any other jurisdictions, whether concurrently or not, to the extent permitted by the law of such other jurisdiction. These Terms and any document expressly referred to in them constitute the entire agreement between you and us and supersedes and extinguishes all previous agreements, promises, assurances, warranties, representations and understandings between us, whether written or oral, relating to its subject matter. The use of third party websites is entirely at your own risk. Where applicable, links contained in the Website may lead to other websites not under our control, and we accept no liability for the content of any linked site or any link contained in a linked site. Links provided on the Website are provided to you only as a convenience and the inclusion of any link does not imply reliability and endorsement by us of the content of any third party's website. You are not permitted (nor will you assist others) to set up links from your own websites to the Website (whether by hypertext linking, deep-linking, framing, toggling or otherwise) without our prior written consent, which we may grant or withhold at our absolute discretion. We are very proud of our high standards of customer service however, in the event that we fail in meeting these standards, please contact us at the address Metano Limited, Unit 14/15 Whinfield Way, Whinfield Industrial Estate, Rowlands Gill, Tyne & Wear, NE39 1EH. Our aim will always be to deal with your complaint as soon as possible and make every effort to reach a satisfactory conclusion in order to retain your valued custom. All Website, design, text and graphics belong to us. All copyright, trade marks and other intellectual property belong to us. You are not permitted to use the Website in any way that may infringe the intellectual property rights contained in the Website. This means that you may not adapt, reproduce, publish, upload, extract, alter, store, post, redistribute, reutilise, retransmit or broadcast, all or any of the contents of the Website including but not limited to any trade marks or copyrighted material without our express permission. However, you are permitted to download and print out pages from the Website for the sole purpose of viewing for your own personal information. You warrant to us that you have and shall at all times comply with all of your obligations under the Data Protection Act 1998 (Act) and all other relevant laws and e-privacy legislation and that you shall indemnify us (and keep us indemnified) in full against any costs, losses, damages, expenses or claims incurred by us (including but not limited to any fines imposed on us by the Information Commissioner's Office or other regulator as a direct or indirect result of your breach of this clause 23.1) as a result of a breach by you of your obligations under the Act or these Terms. If you register a Product on behalf of your customers, you shall be solely responsible for obtaining all consents, permissions and approvals from your customers relating to the collection and use of their personal data as is necessary to register the Product. This information is used only to send you transactional emails with respect to our website. You are able to adjust how you would like us to use this information by logging into your account and amending those options. _metano_uniq, no data held, expires midnight (relative to the visitor) of the next day, Counts the number of visits to a store by a single customer. cart, unique token, persistent for 2 days, Stores information about the contents of your cart. metano_digest, unique token, indefinite If the shop has a password, this is used to determine if the current visitor has access. Shipping To return your product, you should mail your product to: Unit 14/15 Winfield Way Gateshead Rowlands Gill Tyne and Wear NE39 1 EH.